Här har vi en adapter för att kunna montera de kvadratiska balunerna med en Decora kompatibel ram. Adaptern är i ett stycke så det finns inga detaljer eller extra delar att tappa bort. 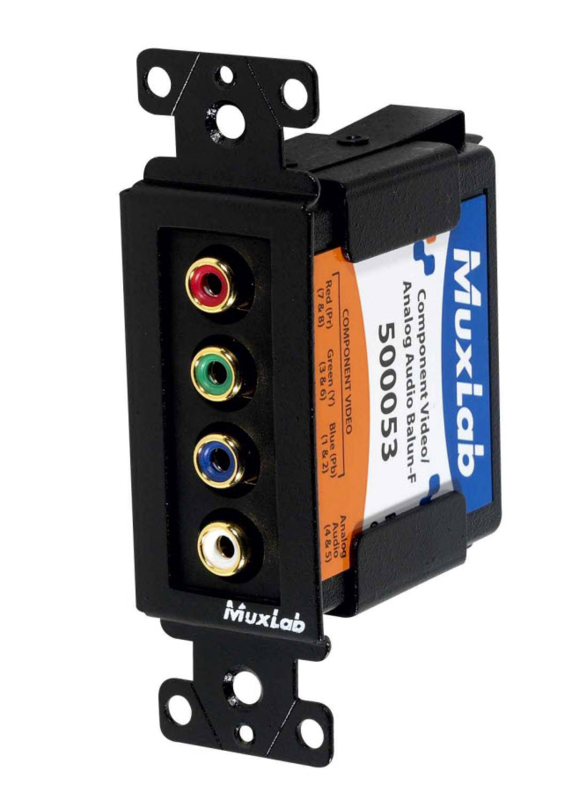 The Wall Mount Balun Fixture allows any MuxLab square balun to be installed behind a DecoraR compatible wall plate for custom AV installation. The baluns may be installed with the RJ45 either front or rear facing depending on where the Cat5 cabling will enter or exit the system. At the head end, the appropriate MuxLab baluns are installed near the equipment to support a fully Cat5 cabling solution. Each balun snaps into place and is held firmly by a spring latching mechanism. The one-piece design makes the product easy to install and maintain. There are no parts to lose or replace..